We are driving to a party when my wife suddenly stops beside a body. He is lying on the steep hill on our dirt road in rural Vermont, almost a mile from our nearest neighbor. We cautiously approach. He lies amidst bracken fern, his white hair a sharp contrast with the green foliage. He has a blood on his cheek, apparently from a fall against exposed bedrock. His chest moves evenly; eyes are open, his fly unzipped and his underwear down, as if he had stepped to the side of the road to urinate, and then passed out. A red fishing pole lies nearby. It’s an odd detail, given the drought and the general absence of fish in the area. My mind races for the appropriate response. Does he need help? Is he a threat? I feel especially protective because my wife stands nearby, with my young boys in the car. My mother waits in her car behind us. These strange moments challenge my martial and ethical skills. It is easy to feel kindly towards those I love in one moment, or angry and frightened in another, in particular when I sense imminent threat. A primal response to the unknown makes sense in terms of our survival as a species; we learn who belongs to the tribe and who is an outsider: we decide who is friend, and who is foe. * But it is hard to know how to respond when feelings of altruism are mixed with the tingle of possible danger. It is also difficult to make complex ethical decisions when one does not have the luxury of time. In the heat of the moment, decision-making becomes an instinctual rather than an intellectual process. To make matters worse, powerful emotions like fear override our ability to make positive choices. Is it possible to be tough and caring in the same moment? 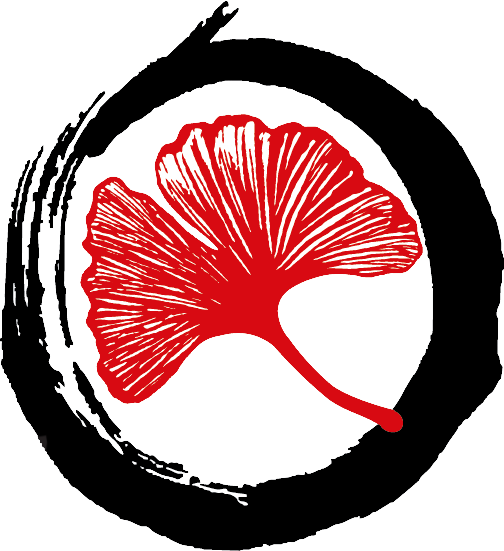 Aikido training cultivates sensitivity and martial awareness. An emphasis on proper posture and a non-aggressive defense stance (upright body, hands open and soft) develops relaxed alertness. This casual stance implies confidence and assertion without the threat of violence. Simultaneously, the spirit of equanimity cultivated by muscular relaxation allows one to respond so that fear doesn’t override rational and ethical decision-making. It is difficult to relax in a physical or verbal conflict because conflict is fast, unpredictable and messy. Perfection is hard to achieve; our practice is one of degrees. Daily training allows us to discover greater depths of peace and integrated movement. Ideally, our creative ability to respond to conflicts off the mat should mirror our technical growth in aikido. Take a look at this photograph. It powerfully illustrates photographer Cartier-Bresson’s “decisive moment”. 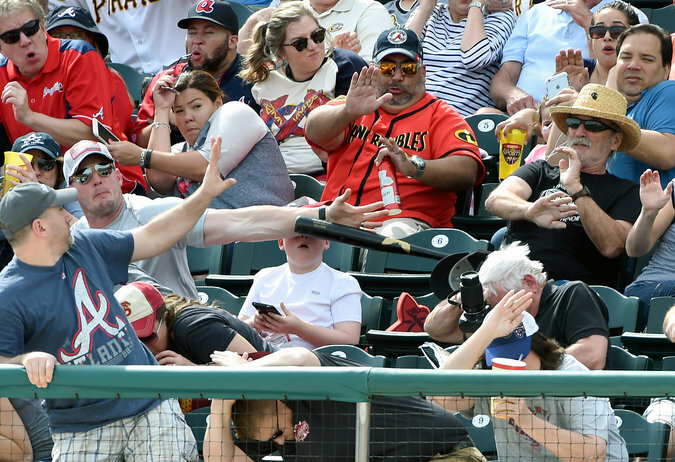 The son, mindless of imminent danger, examines a cell phone, while the father, face taught with concentration, extends his forearm, blocking the bat. It is a terrifying moment. But it is also fascinates because it illustrates a dramatic range of responses to the flying bat. While most of the spectators are hunched and frozen in private fear, the father’s sole imperative is to protect his son. Beyond him, another man extends his arms in a rather martial position, both arms forward, shoulders relatively relaxed. Note how the various people manifest fear and muscular tension in different ways. If we caught your photo at this ballgame, how would you respond? Does your instinctual response to threat create crippling tension, or allow you the possibility of freedom and action? Would you protect the people you love, like the father in the photograph? Does your training prepare you for the decisive moment? And finally, are you able to control anger and fear so that you do not cause excessive harm, even if this harm is legally justified? This of course is all nonsense. I describe this scenario because in my anxiety, I imagined such a possibility. Instead, we asked the man if he needed medical help. I didn’t know if his fainting spell was related to the consumption of drugs or alcohol. I didn’t know if he was dangerous; in the event of an altercation, I noted his powerful, stocky build, and remained outside easy striking distance. We decided that my mother would drive home and call the police, and I followed the man on foot in case he followed my mother to our house. Instead, he turned on to the old town road, walking at an uncannily fast rate given the fact that he had been apparently unconscious a short time before (in retrospect, I realized that his rapid pace might be due to his realization that his drawers were down- embarrassment, like fear, is a powerful motivating force). We often confuse belligerence with courage. I wanted to intimidate him so he would stay away from our property. Instead of an overt threat, I managed a snide comment with regards to his fishing pole: “the fishing is pretty bad around here, isn’t it?” He looked back at me, made no response, and disappeared down the old town road into the forest beyond. In that moment I realized that I still had much to learn regarding discovering a balance between empathy and vigilance. Sometimes, letting go of bluster requires courage and commitment. So much depends on our ability to be awake and ready in the decisive moment, when love and fear commingle with instinct, and everything is possible. Are you ready? *Emotions like fear and anxiety help us survive dangerous situations, but they make it difficult to perceive complexity and nuance. The creaking steps may be an intruder in the dark of night (I better get the gun! ), but maybe it is just your kid on her way for a soothing snuggle after a bad dream. We live in a time in which fear grossly simplifies political discourse: Presidential candidate Donald Trump’s success has been in great part due to his pandering to white America’s fear of minorities and immigrants. “The Red Wheelbarrow” from the Collected Poems of William Carlos Williams volume 1, New Directions Book.